In Part 1-Trying to increase revenue before providing more value. 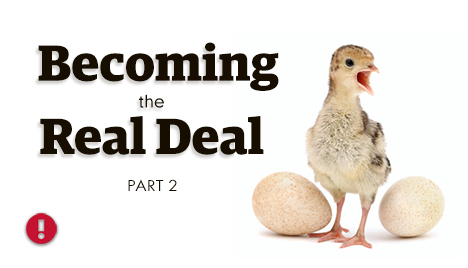 In Part 2– Trying to sell your product before you believe in it yourself. In Part 3– Investing in your business before investing in yourself. In Part 4– Trying to succeed while ignoring essential tools. Every time Tom had his friends over for dinner, he received glowing 5-star reviews. His friends said, “You know, you really should open a restaurant! This is fantastic!”. And Tom does love to cook. So on a wild hair day, he cashed out his savings and invested in equipment and real estate. A month before opening day, most of his start-up cash was gone. Because of this, he had no ability to decorate like he wanted or invest in an identity and advertising. But he was not worried. If his food were half as fantastic as his friends said it was, he would not have any problem getting people in the store. He was certain his classic menu would appeal to everyone. He would skip the logo and the website for now, and invest in those things later when he made some real profit. The next week, a rush of people came in to check out the new restaurant in town. He was excited and encouraged. But after the first month, traffic slowed to less than adequate. Tom decided an inexpensive brochure from the local quick print shop would help, and hit the next chamber meeting. But six months later, he was still struggling to get people in the store. He tried a very different but a better-looking brochure. With only a little response, he had to lay off staff. Tom decided that advertising does not work and decided to stop advertising altogether. As a result, instead of providing a nice place to eat, the restaurant ate him up instead. Dave also relished good friends and good food. His specialty was making people feel welcome. His friends also told him on a regular basis that he should open a restaurant. And on a wild hair day, Dave also cashed out his savings. But––Dave was determined to begin his restaurant in a different way than the way most restaurants start out. He started by planning the ultimate experience. He knew that personality and ambiance would provide the ultimate brand. He researched other restaurants in town–not to copy, but to figure out how to be different and better. He invested in a graphic identity and brand style guide that communicated this personality and set the stage for expectation. It was as good as done. After creating the style-guide, every decision was easy from there. From this Brand vantage-point, it was clear how to create an atmosphere where young professionals would want to bring their friends and hang out. Even choosing the decor was easy. It either matched the style or it did not. He knew a great location that was already swarming with young professionals. He researched the price point they would be willing to pay. He then structured his recipes with a balance of flair and profit, topped with a spark of lagniappe. Opening day, the store fit the vision and the plan inside and out. Everything matched the perception he wanted to achieve. Friends told friends. The waiting line on Saturday night wound outside the door. Because he had invested in branding first, his Visual Voice was consistent across his print collateral, website, interior, and brochures. He looked credible–and his customers had confidence and expectations of a good meal before they came in the door. His performance answered their expectations. And when it came to a choice of where to go out to eat, people started to choose Dave’s place. 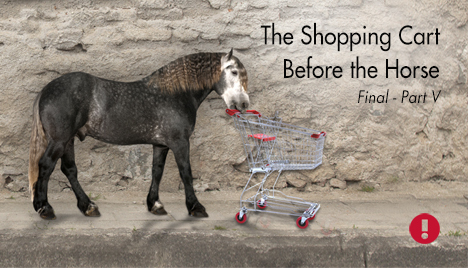 When you Advertise before you Brand, you get the Shopping Cart before the Horse. Nothing you do builds on any prior effort, creating minimal if any return. Every advertisement is like starting over. This is why advertising does not work. If your advertising is yielding minimal return–“Stop. Do not pass Go! Do not collect $200.00.” Back up and start with your Brand. Branding builds upon your vision. It creates an experience. It answers your customer’s questions. It solves their problems. Branding helps your messages resonate with the right customer. Begin with everything that touches the customer. When you have a strong Brand, you have a strong stand. Your advertising builds momentum. The return increases exponentially because it is memorable and consistent. Branding is not just a first impression or the logo above the door. Branding is the way you take the whole journey. Brand first, and prepare yourself to be pleasantly surprised. Why do we, a graphic design / and advertising company, care about the way you run your business? Because no matter how beautiful your external graphics, they will never be stronger than your internal management. If your management is strong, so are your communications. Since entrepreneurs are famous for getting the cart before the horse, all this month, we have been discussing five of the most common ways that entrepreneurs are hitching their horses incorrectly. Since this is the new millennia, we have updated the idiom. The vehicle of commerce is now a shopping cart. Either way, wooden or metal, horses still do not know what to do when the cart is in front. Our desire is to help you, the small business owner, think like a marketer.